Museums, like many organisations, are embracing the agile world of digital media to build cohesive, visitor focussed experiences that bridge the physical and digital. 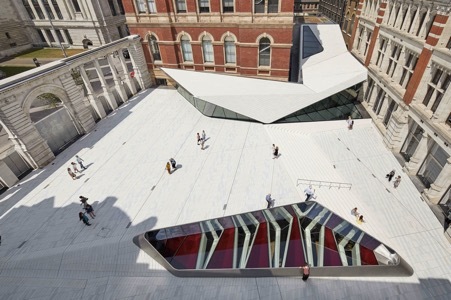 Drawing on the principles of good user experience design (UX), our goal is to make sure visitors have great experiences and interactions with the V&A wherever they are – whether that’s online or in our buildings. We all talk of creating – in what now feels like something of a cliché – ‘seamless experiences’, where visitors move fluidly between the physical and the digital. We know it’s vital to ensure consistency between these physical and digital touchpoints (in other words, the points of contact between a business and its customers). That consistency is not just visual, it’s tonal, functional and gestural. The idea of a standalone digital strategy is therefore becoming increasingly redundant: it’s more relevant now to talk of experience strategy, one that doesn’t separate out the digital, but puts the visitor at the heart of the experience, whether that’s a digital or a physical experience, or – most likely – a blend of the two. It was with this thought in mind, that we approached the development of a welcome experience for the new Exhibition Road Quarter, which opened in July 2017 and provided the V&A with a new entrance, courtyard and purpose-built gallery for temporary exhibitions. An interesting aspect of (indeed, one of the original intentions behind) the V&A’s new Quarter, is that it’s completely changed our relationship with Exhibition Road, the main artery of Albertopolis. We are better able to entice people into the Museum and, we are now truly connected with our Exhibition Road neighbours the Science Museum and Natural History Museum and, further up, Imperial College London and the Royal Albert Hall. 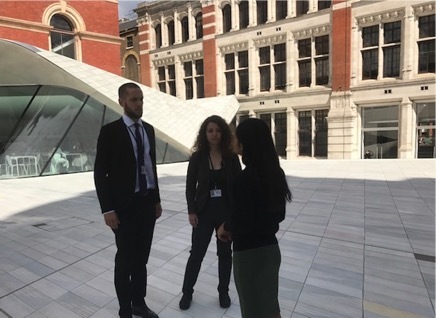 The new Sackler Courtyard offers a ‘decompression zone’ – a threshold space between the busy Exhibition Road and the Museum itself. Like plazas, parks and entrance courtyards to other museums, this threshold space allows people to enjoy the beautiful surroundings without having to commit to entering the building. These are important transitionary spaces, helping to ease people into the Museum which – for some – can be intimidating. The Courtyard can simply be a place to hang out, to let small people run around, to enjoy the sunshine or to have a coffee. The development of the Exhibition Road Quarter has changed how we welcome visitors to the building. 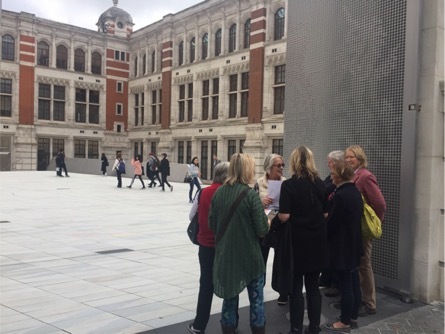 It has helped open up the Museum to visitors – regulars and newbies alike – to help them understand the V&A story and to get the most from their visit. This was not by accident but rather by design. By experience design. Back in late 2013, when I joined the V&A, the building works had begun on the Exhibition Road Quarter. We were thinking about our ‘digital welcome’, a concept that had been put forward in our funding application to the Heritage Lottery Fund (HLF), who contributed significantly towards the development of the new quarter. So, what was the ‘digital welcome’ that had been proposed? Our application spoke of ambition to better use digital technologies to help people to find out what was on offer at the V&A and to explore the building and its heritage. Well ahead of opening, the document promised, we would have a ‘digital welcome app’ that visitors would be using throughout the Museum. 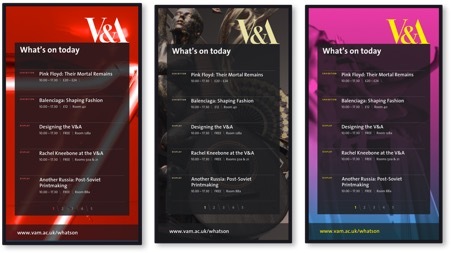 And, for the opening, we committed to developing a ‘Tour the V&A Building’ app and as well as digital signage. But the original proposal to the HLF was written in 2012, and so much had changed since then, both in terms of technology and in visitor behaviour and expectation. 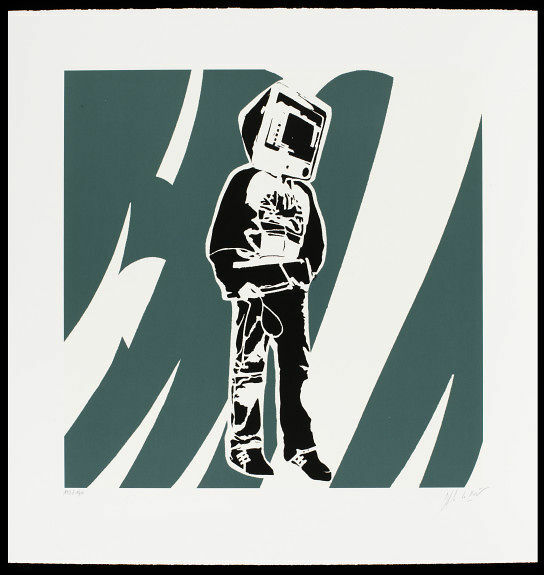 I struggled with the term ‘digital welcome’ – it conjured up visions of Blek Le Rat’s Computer Man. I feared it would entail potentially clunky digital additions to the physical experience. The intention of ensuring digital media is a core part of the welcome experience is, fundamentally, a good one. But to separate out the digital from other elements of the welcome experience risks a fragmented visitor experience that doesn’t intuitively blend the digital and the physical. Instead of focussing on the delivery mechanism – digital or otherwise – we needed to take a step back, and understand what our visitors want and need as they enter the Museum. 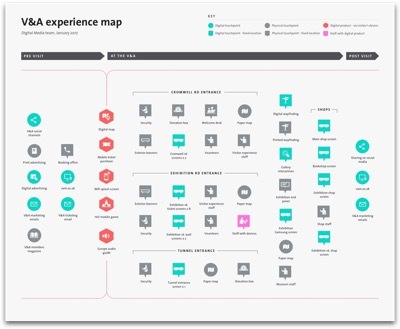 So, we created a customer experience map – a visualisation of the different journeys our visitors take, with a view to improving their overall experience. The map shows all the touchpoints that a visitor could encounter as part of their visit. It includes both temporal and spatial elements, moving from the pre-visit interactions with the Museum, and into different parts of the building, ending with their post-visit encounters. A tech savvy music loving exhibition visitor, 43, at the V&A for the first time to see the You Say You Want a Revolution? Naturally, visitors will have interactions with different touchpoints according to their individual journeys. As well as mapping their physical journey, we mapped their emotional journey too. Most obviously, our staff help mesh the experience, and are a vital part of making people feel welcome. Some digital touchpoints, such as the digital map weren’t immediately obvious or apparent to the visitor as they weren’t sufficiently advertised in the building. There wasn’t a well-defined purpose for some of the touchpoints, such as the digital screens in the Cromwell Road entrance. There was an opportunity for additional touchpoints, such as digital donation points. It was this penultimate point that helped us identify a direction for some of the digital touchpoints that would form part of the welcome for the new Exhibition Road Quarter. 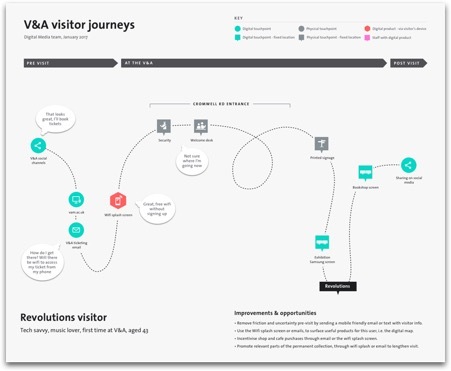 Each new touchpoint needed a clear purpose and position within the visitor journey. And, it was vital to understand all these touchpoints – whether digital or physical – as an ecosystem; they needed to work cohesively and as part of a holistic experience. While the focus was on the new entrance, it was also important to ensure consistency for all entrances, and not to forget the Cromwell Road entrance and tunnel entrance (which was also being refurbished). Like most visitor attractions, the most important element of our welcome experience is our staff and volunteers. To support the opening of the new Quarter, we recruited a raft of new volunteers, aiming to double our volunteer numbers by opening. Our volunteer team prioritised recruitment from areas of London with a high percentage of BAME populations, and travelled the boroughs, introducing the V&A to volunteer forums and fairs, and inviting people to come and visit the Museum to find out more. It was a big success, and we increased volunteer numbers from 210 in 2012 (when we submitted the HLF application) to 450 in May 2017. Not only were the numbers up, but our volunteers were more diverse, with 26% from a BAME background, and 10% with a disability. By celebrating the diversity in our workforce, we hope to welcome a broader range of people to the Museum. People are what pulls together both the physical and digital elements of our visitor experience: through their conversations with our visitors, our staff can best identify which of our touchpoints might best help them – a printed map to navigate the building or a guide to 20 of our greatest treasures, the digital map to locate particular objects, or perhaps an audio guide for those interested in our Europe 1600-1815 galleries. Since some of our digital touchpoints are not so visible to people inside the museum, our staff play an important role in making our digital products more obvious and apparent to the visitor. We are now looking to install additional promotional screens to advertise our digital products (among others), the digital medium being best suited to showing some of the features and value of these products in enhancing the visitor experience. We’d learnt from our mapping exercise that some of our digital touchpoints – screens mainly – didn’t have a clear purpose. For example, our existing screens had a mixture of promotional and informational messages and could end up being overwhelming to the visitor. And so, we’ve also created a much clearer rationale of what elements are used for what purpose. 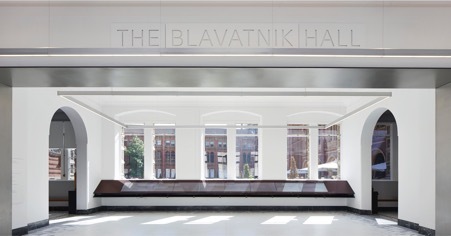 AL_A’s designs for The Blavatnik Hall included a spectacular bank of eight 56 inch screens, which showed information about events, content from exhibitions, map and navigational information. However, when it came to designing a digital experience for these screens, we wanted to launch with a minimum viable product (MVP) that served the core user need. Having done some research around current ticket purchasing behaviour, we discovered that 98% of purchases at the Cromwell Road entrance were for today’s exhibition tickets (rather than future events). So, for our MVP, we prioritised selling exhibition tickets for today only. Our former design lead Chris Pearson wrote a blog post which tells the design story behind the screens, and how he designed a beautiful, functional and accessible interface for ticket sales. We had proposed digital signage in our HLF application. Our user research suggested that wall screens should help visitors discover events and activities but should only focus on that day’s events. We drew on the work we’d recently done for the new What’s On, and, within a matter of days, we developed a lightweight version of What’s On that stripped out extraneous information to provide easily scannable event listings using the same events API. Working closely with our Visitor Experience and Marketing teams, we created this web app to power the screens, which refreshes every morning using Scala CMS. Though the impetus was for the opening of the Exhibition Road Quarter, these screens are now used in the tunnel entrance, and will soon rolled out in our Cromwell Road entrance too. A key driver in our redesign of the new entrance was to celebrate the heritage of the building. We originally proposed a Tour the V&A app which would help visitors explore the architectural history of the building. Since writing our HLF proposal back in 2012, we (like many others) have learnt that museum apps don’t typically have the uptake we’d have once hoped for. Bar a few notable (and well-funded) exceptions – like the SFMOMA app and the Brooklyn Museum Ask app – most have become expensive, hard to maintain experiments. Picture yourself on a tourist trip to a museum. Are you going to fill up your phone with a new app that you’ll use once, and reducing the battery life you might prefer to save for tourist snaps later on? 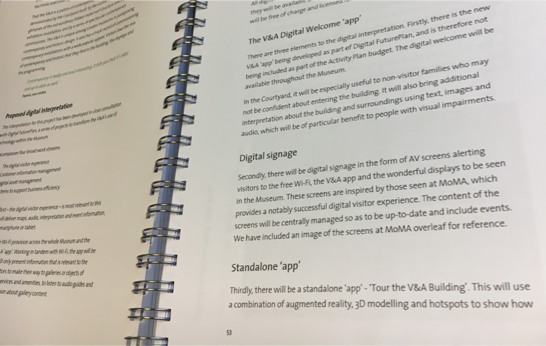 However, knowing that the uptake of mobile within the V&A is still relatively low, we also created a paper guide to the V&A Story as told through its buildings, alongside a family paper trail, as part of the interpretation that supported the opening of the Exhibition Road Quarter. This meant the narrative could be accessed by a wider range of audiences in ways tailored more distinctly for them. Given that we consider all our touchpoints as part of an ecosystem, it’s vital that each draws from the same design language, and helps communicate a consistent brand experience. We worked hard to ensure that all the digital and physical components work together cohesively – from the Wi-Fi welcome page to the wall screens, and from the V&A Story trail to the volunteers. In digital terms, we used the design language established in our 2016 website refresh, further developed for What’s On, to develop the wall screens and ticketing kiosks. We use generous, compelling imagery, with bold use of the iconic V&A logo and clear labelling and calls to action. We drew on our design library, Fractal, (a little like a Lego kit of digital components), which ensures we use the same code for each feature, making for a more efficient design and development process, and consistency for the user. Our work on the Exhibition Road entrance helped us consider consistency not just at product level, but across all our entrances, to ensure that there is a consistent welcome at each. Security of our visitors, staff and collections, is critical, however. And there are new forms of security that are less obtrusive, yet just as effective (if not more so). For the opening of the Exhibition Road Quarter, we rolled out a more dynamic approach to intelligence-led security. Our new behaviour detection officers aim to make visitors feel welcome, and to provide a secure environment. They use an intelligence-led approach so that they’re looking for unusual behaviour in the space, rather than unusual people. It’s an approach that has proven successful in Amsterdam where is used by the Van Gogh Museum and Rijksmuseum – it has reduced petty crime across Museum Plaza by 70%. In mapping out user flows across the physical space we begin to put ourselves in the shoes of our visitors, to understand better which touchpoints can help them at different points in their journey. Staff are the most important touchpoints for our visitors, and that’s why it’s important they are the first people our visitors encounter, rather than being greeted by security staff or screens. Digital touchpoints are an important part of our welcome ecosystem. But there is room for more. As part of our mapping exercise it became clear that there was potential for digital donation points, and these have been recently introduced to the building. It’s been an interesting process and we hope to share the results of our digital donation pilot soon. In future, we’ll be exploring how best to show branded video content, and content about our collections to help people understand what’s on offer. We’re about to embark on a new wayfinding project which will see us develop a new version of the award winning V&A digital map, and explore the potential of information kiosks at some of the physical pinch points where we know our visitors could do with some assistance. Designing a good welcome experience not only helps our visitors, but also helps us achieve some of our business goals (around selling tickets and upselling membership, for example). This project reminded us that the best results come from working in cross-functional teams, (in our case across Visitor Experience, Digital Media, Marketing, Design, CRM and IT) and that using data and user insights to inform the development of our welcome is vital. We’ve learnt that building a brand experience culture takes time. Now, more than ever, we need to understand and grow value for the business – to get more people in, give them a better experience when they’re here and leave them wanting to return. We need to understand when and where in the visitor journey we should be presenting different calls to action: when should we be asking for donations? When best to capture customer data? When to encourage visitors to become members? These questions are ones we tackle every day working in the digital space. And these questions apply as much to digital as they do to the physical – we must actively work to bring the two together. The development of the new Exhibition Road Quarter has prompted us to rethink how we welcome people to our buildings, and we’ve learnt a huge amount on the way. And now we turn our thoughts to designing our farewell moments, to make them as compelling as our welcome. I oversee all digital goings on at the V&A. Writing as a regular Tuesday afternoon volunteer at the V&A, I never saw anyone use the digital donation point that was stationed for weeks in the Blavatnik Hall, a few feet to the right after entering from the Sackler Courtyard. Maybe I was just unlucky! 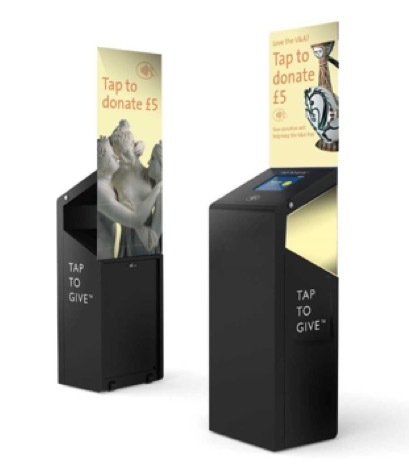 But I suspect the digital donation points would be used more if they were placed right alongside traditional cash donation boxes. That way visitors could not be in any doubt about what the digital donation points are for. I just what to say great job, i can see that you guys work for the visitors, not like other places that i went to, i entered to see an exhibition, and left with no idea what i saw, there was no information no guidance… nothing. After reading this article just makes me want to visit you guys. Keep up the great job.